Cristo Barrios will participate in the Festival Internacional de Música de Canarias 2019 with the group of which he is a founding member, Quantum Ensemble. Programme: INFLUENCES: Sonata for violin and piano in G major, number 2 by Maurice RAVEL, Sextet for clarinet, piano and string quartet by Aaron COPLAND and Quintet with piano in A major, op. 81 by Antonin DVORAK. 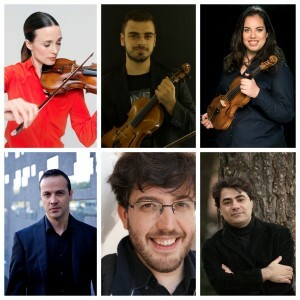 Performers: Frederieke Saeijs (violin), Pablo Díaz (violin), Cristo Barrios (clarinet), Cecilia Bercovich (viola), Iván Siso (violoncello) and Gustavo Díaz-Jerez (piano). Dates and places: January 28 at 8:30 pm (Conservatory of Music of the Canary Islands – based in Tenerife) and January 29 at 8:30 pm (Conservatory of Music of the Canary Islands – based in Las Palmas de Gran Canaria).